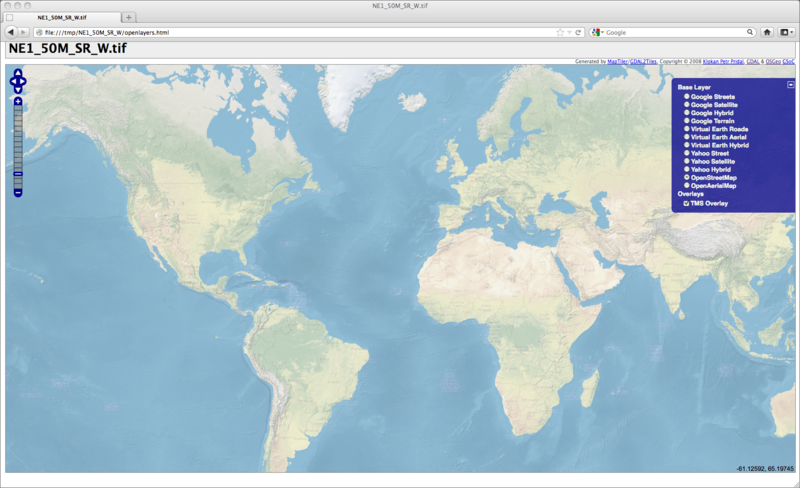 Default OpenLayers application produced by the gdal2tiles command and a Natural Earth background dataset. Tiles in a Tile Map Server (TMS) context are basically raster map data that’s broken into tiny pre-rendered tiles for maximum web client loading efficiency. GDAL, with Python, can chop up your input raster into the folder/file name and numbering structures that TMS compliant clients expect. Default OpenLayers application produced by the gdal2tiles command and a Natural Earth background dataset as input. The bonus with this utility is that it also creates a basic web mapping application that you can start using right away. The script is designed to use georeferenced rasters, however, any raster should also work with the right options. The (georeferenced) Natural Earth raster dataset is used in the first examples, with a non-georeferenced raster at the end. There are many options to tweak the output and setup of the map services; see the complete gdal2tiles chapter for more information. gdal2tiles.py NE1_50M_SR_W.tif Generating Base Tiles: 0...10...20...30...40...50...60...70...80...90...100 - done. Generating Overview Tiles: 0...10...20...30...40...50...60...70...80...90...100 - done. Open the openlayers.html file in a web browser to see the results. The default map loads a Google Maps layer, it will complain that you do not have an appropriate API key setup in the file, ignore it and switch to the OpenStreetMap layer in the right hand layer listing. The resulting map should show your nicely coloured world map image from the Natural Earth dataset. The TMS Overlay option will show in the layer listing, so you can toggle it on/off to see that it truly is loading. Figure 5.2 (above) shows the result of our gdal2tiles command.